LifeShare is celebrating those who have given the gift of life as well as those who have received that gift. The Morrison family, of Roff, Okla., has been deeply impacted by the generous gift of donation and transplantation after both a father and daughter (pictured on the right) were in need of a new heart. Paul Morrison and his family moved to Roff, Okla., for ranching opportunities. During the time he and his family were moving, Paul began feeling sick, and after a series of tests, the doctors realized his heart was failing. His health continued to decline and he was put on the transplant waiting list. He began feeling better and was offered a heart in 2004, but turned it down because he thought he was recovering. Four years later, Paul began struggling with severe cardiomyopathy. He was in and out of the hospital and received a heart transplant in Sept. 2009. Just one year after her father’s heart transplant, Natalie Morrison was working full-time at a photography studio. She had a passion for photography and often worked on her family’s ranch. She never seemed to be hungry and had not been eating, but her family thought it was because she was so busy. One morning, she became weak and dizzy, which Natalie thought was just dehydration and went to work. Later that day, she became nauseated and began to feel sharp pains in her chest. She called her sister and brother-in-law and they picked her up. When she didn’t improve over the next few days, they made a trip to the emergency room. After receiving the results of Natalie’s blood work, the doctor sent her directly to Oklahoma City by ambulance. After a week in the hospital, Natalie was sent home with a Life Vest, a personal defibrillator which monitors the heart. Natalie wore the cumbersome vest as often as possible. The doctor noticed she was doing well and told her she could take off the vest occasionally. One night, she came home from being out with friends and couldn’t decide whether she wanted to wear the uncomfortable vest to sleep. She made the decision that night to leave the vest on and woke up in the middle of the night feeling like her skin was burning – Natalie’s heart had stopped and the vest had shocked her. Natalie’s doctor looked at the records from the vest and told her if she hadn’t had the vest on, she would have died. Her doctors decided it was time to surgically implant a defibrillator in Natalie’s chest. A few months later, Natalie was out taking photos around the ranch and her father was doing chores when he saw something lying on the ground. When he came closer, he realized it was Natalie, lying unconscious but still alive. He called Medi-flight and Natalie was flown to the hospital. “They didn’t know if I was alive when they put me in the helicopter,” says Natalie. When she got to the hospital, the doctors had to replace her defibrillator. Not too long after this incident, Paul and Natalie went to visit her sister and brother-in-law. One night, the dog woke the family up barking. 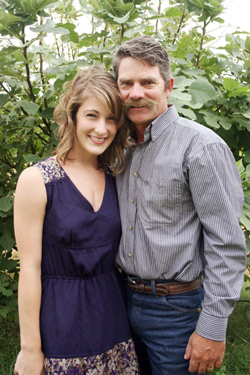 Natalie’s heart had stopped beating – and her father and sister began CPR on her. She was taken to the hospital and the doctors began the discussion of a heart transplant. One day around Christmas when the Morrison’s had friends and family visiting their home, Natalie’s transplant coordinator called with good news: they had a heart for her. Natalie is now 27 years old. She has gone back to work full-time, works out with a personal trainer at the gym. She continues to love photography, the art of pottery and helps brand and vaccinate the cattle. She also has met and is engaged to the love of her life and will marry him soon. Natalie is forever grateful for the life-saving gift she received from a selfless donor. Across the United States, more than 121,000 individuals wait for an organ transplant to save their life, of these, more than 700 are Oklahomans. Thousands more are in need of tissue and corneal transplants to restore mobility and sight. Without the generous gift of more than 15,000 donors in the United States per year, many would still be waiting for a lifesaving gift. You can give the gift of life by registering to be an organ, eye and tissue donor at www.LifeShareRegistry.org.